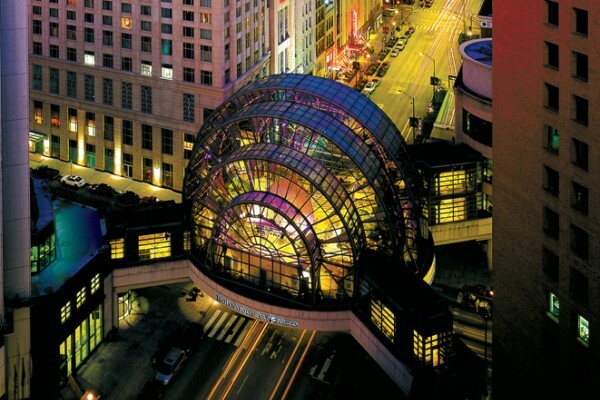 Owned and operated by the Arts Council of Indianapolis, the Indianapolis Artsgarden is a destination for arts and culture in the heart of downtown. The structure is a seven-story tall glass and steel icon over the intersection of Washington and Illinois Streets. The Artsgarden presents more than 250 free and public performances each year, along with monthly visual arts exhibitions by central Indiana artists. It is also rented for private events, including weddings, corporate receptions, and nonprofit events, which support funding for public arts programming. Monday - Saturday, 10 a.m. - 9 p.m.
Sunday, Noon - 6 p.m.
Monday - Saturday, 11 a.m. - 7 p.m.